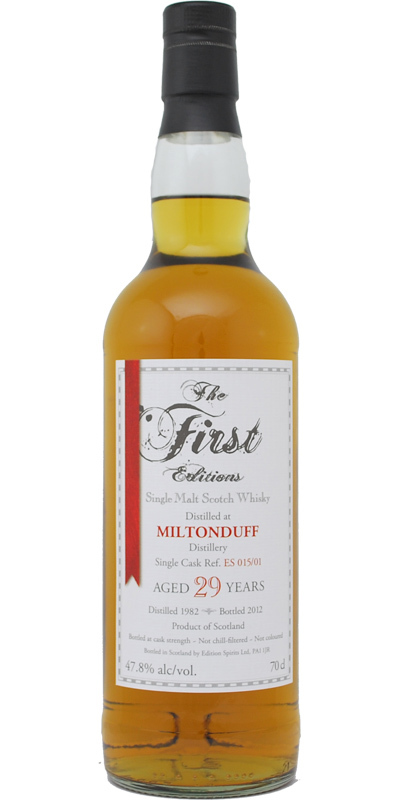 Miltonduff often is a good choice from the ’second-tier‘ distilleries – if such a term does justice to any distillery in the first place – some are just not marketed and overlooked. My favourite Miltonduff expression is a 1966 from the Antica Casa Marchesi Spinola series, an absolute stunner at 93 points. Their old 12 y.o. in the green bottle was a great standard, one still worth seeking out. This release is new and brought to us by Andrew Laing in his series ‚The First Editions‘. Our friend Ras Mazunga likes this a lot (90 points from him), so let’s check it out. Comment: Aaah, very aromatic, enticing and well-integrated right from the start, also a bit unusual (which is a good thing). A gentle giant. 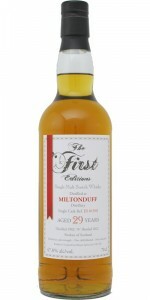 This whisky displays its amazingly ripe tropical fruit (mainly tangerine, guava, grapefruit, but also some pineapple, peach and peach liqueur, crystallized orange, pear and a touch of coconut oil) in a refreshingly sour surrounding, adds toffee, marzipan, macadamia nuts, nettles, a hint of a black peppery spice and something to describe as a vanilla-strawberry-milkshake. The oak is very discrete for 29 years of age. On the palate it is slightly more oaky (but still unobtrusive) and as elegant as malt whisky can get. All elements mentioned are there in wonderful subtlety and translate into a long finish that leaves you wishing for another pour. I recommend drinking it without dilution but water doesn’t hurt the dram, it just doesn’t change it much. Great pick, Andrew, this is a recommendation!